Posted on Thu, Aug 19, 2010 : 11:25 a.m. The future of American Apparel's Liberty Street store in downtown Ann Arbor is uncertain after the chain this week acknowledged major financial problems. The future of American Apparel's downtown Ann Arbor store -- and, indeed, the future of the retail chain itself -- is shaky at best. American Apparel said in a regulatory filing this week that there is "substantial doubt that the company will be able to continue as a going concern," which indicates that the firm may be headed for bankruptcy or liquidation. The retailer, which sells clothes manufactured exclusively in the U.S., occupies a high-profile storefront on Liberty Street near the corner of State Street, a hotspot for Ann Arbor shoppers. The chain, which is known for its racy advertising campaigns and a flamboyant chief executive who freely acknowledged having affairs with his own employees, opened its 4,000-square-foot Ann Arbor store in summer 2005, marking its first location in Michigan. A manager for American Apparel's Ann Arbor store declined comment and referred questions to a corporate public relations contact. American Apparel is known for its controversial advertising campaigns, such as this one visible outside the store this morning. Ryan Holiday, a spokesman for the company, denied that the chain's troubles would hit Ann Arbor. "It is remaining open and the company has no plans to close or consider closing stores," he said in an e-mail. The tenuous position of American Apparel's Ann Arbor store adds to additional uncertainty for the downtown area's retail sector. Borders Group, whose flagship store is located across the street from American Apparel, is also facing long-term questions about its viability as an independent retailer. Nonetheless, the State Street shopping corridor, which remains one of the most expensive places to rent retail space, continues to attract new tenants. In recent months, national drug store chain CVS, fast food chain Five Guys Burgers and Fries, upstart restaurant @burger and others have signed deals to launch locations on State or Liberty. American Apparel's demise is not inevitable. The Los Angeles Times reported that billionaire Ronald Burkle, also an investor in struggling Borders competitor Barnes & Noble, recently acquired a 6 percent stake in American Apparel. In recent months, the troubled company has been beset by sales declines, losses, a crackdown on undocumented workers, problems with its debt, delayed quarterly filings and, most recently, an investigation by the U.S. attorney's office in New York related to the company's abrupt change in accounting firms. Industry experts say the company's problems are so severe that nothing short of a major overhaul in its business practices and management, which could include a possible bankruptcy filing, can pull it out of its free fall. Experts are questioning the ability of CEO Dov Charney to reverse the company's slide. "His enthusiasm for his product is perhaps at odds with the discipline that a retailer needs," Richard Jaffe, a retail analyst at investment bank Stifel Nicolaus, told the Wall Street Journal. 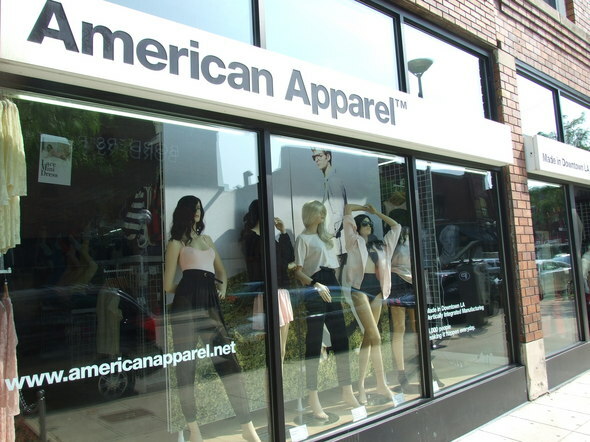 American Apparel's Ann Arbor store is one of three in Michigan and 285 locations in 20 nations. The company's stock was trading at $0.80 this morning, down from a 52-week high of $3.95. The company reportedly expected to lose $5 million to $7 million in its second quarter with revenue from $132 million to $134 million. Fri, Aug 20, 2010 : 4:14 p.m.
"Really? I'm buying some new tires and they will be either Goodyear or perhaps Dunlop. No Japanese or French for me." I only buy Japaneese. So it would seem it's not that crazy of an idea. Of course the tires are no cheaper, but I am familiar with the brand and quality so i know what I'm getting. Fri, Aug 20, 2010 : 3:56 p.m.
"Do Americans really care about where a product is made? Usually, price and style are more important. After all, we are a world economy now!" Really? I'm buying some new tires and they will be either Goodyear or perhaps Dunlop. No Japanese or French for me. Chinese tires? I value my safety as I go much faster than 60 MPH. Outsourcing is a game of musical chairs where everyone is better off with lower prices, until you are the one without a chair (a job). As time goes on, more people ate out of jobs and our standard of living declines. It does appear that this firm employed illegal aliens from Mexico, who contribute to the low wages of the working poor by flooding the supply of unskilled labor. Fri, Aug 20, 2010 : 9:44 a.m.
You CAN make clothing in the USA and make money. "3 Dots" is a clothing company that makes superior, wonderful cotton clothing right here in the USA...doesn't shrink, doesn't fade, is cut beautifully/very flattering. A tops costs between $35-$60, but you will be able to wear it for years. Fri, Aug 20, 2010 : 5:41 a.m. It would be interesting to know how the local store is doing. If a store like this can't make it a block from the diag.... And re:chains.... Is this a franchise? If so the owner IS local. The people put out of work are local. There just are not jobs hanging from trees in Michigan. Thu, Aug 19, 2010 : 7:14 p.m. I can't say I'm that upset about this. I feel for the people losing jobs, but as for Dov Charney, well.......all I can feel is schadenfreude. He really is a wart on the posterior of humanity. If you don't believe me, just....google "Dov Charney". And, it'll all become apparent. Thu, Aug 19, 2010 : 6:54 p.m.
Those interested in the AA saga, its odd policies, its odd leadership, its odd ads, should note that the American Apparel story has been followed closely on gawker.com, a gossip website that occasionally has great news-like projects. As for me, I would pay AA prices if the products seemed substantially better than Hanes underwear. But for men, I'm not seeing that. They're finished. Thu, Aug 19, 2010 : 6:10 p.m.
@uawisok "capitalism is not a sustainable model" WOW. That is all I can say! If that is the belief in Ann Arbor, no wonder the City is falling apart! Wow! Thu, Aug 19, 2010 : 5:42 p.m.
You get what you pay for when buying imported products: double digit unemployment,foreclosures,stressing families to the brink (i guess that's republican family values) capitalism is not a sustainable model, retail and a consumer economy is not sustainable, our family buys only 2nd hand clothes because we refuse to pay even $15.00 for a "marked down" shirt someone making 40 cents an hour who is under the age of 16 in Vietnam,Laos (fill in the blank) Capitalist greed and greedy consumers are why people around the world are being exploited. I just read the WSJ article were retailers are leaving China because the wages there are too high, 72cents an hour..LOL!!!! Shop waway sheeple!!! Thu, Aug 19, 2010 : 5:09 p.m. I'm questioning what makes something "local." You're complaining about chains, which may be just as "local" as anything else. I go to Zingermans and buy a sandwhich, that's local. Now the pig probably isn't slaughtered out back, the Vermont chedder cheese doesn't come from here...etc., But that's "local" casue it's owned by local people? Well what if I open a McDonalds downtown? It's franchise that I own, a local person &amp; it employs local people; what's the difference? Don't even get me started on the whole "Artisan" stuff going on these days either. I literally have read comments on this board complaining about a coffee chain instead of buying "local" coffee. I don't see any beans growing aorund here, but i guess an "artisan" buys them and spinkles some spices on there and it's "local." Thu, Aug 19, 2010 : 5:01 p.m. I'm not sure I get the point. What does it matter where they get their merchandise or where it is manufactured. Buying from locally owned businesses means they (hopefully) are a bit more attuned to what it means to support Ann Arbor than American Apparel (.et,.al) which has their headquarters weho knows where. I din't think all of Fingerle's lumber and drawer pulls are made in America or Anderson's Paints are mixed in the kitchen. I guess I missed your point. Thu, Aug 19, 2010 : 3:34 p.m. Right well eating at local businesses and buying lumber from fingerle is one thng and makes sense. Buying clothes is different. I understand there's a huge group of people in this town that love to throw on there fanny packs &amp; crocs and hit the town, but some of us like to dress a little better. Does Van Boven get all their supplies from Michigan &amp; make everything right here in Michigan? Thu, Aug 19, 2010 : 3:19 p.m. The blade on the guillotine has just begun to fall on retail in Ann Arbor - just as with other segments of the local economy, the relative strength here has cushioned the impact somewhat. Many local businesses have been hanging-on by their fingernails, so any further decline or weakness in the economy could push them over the edge. Haberdasheries, bookstores, bars&amp; restaurants, dust-catcher shops - all are vulnerable in this double-dip environment, despite Nathan's balmy outlook. Thu, Aug 19, 2010 : 3:01 p.m.
@Lokalisierung... Why so cynical about local businesses or the concept of shopping local? Sure, they go belly-up, too. And probably at a greater rate than the chains. But with local businesses conduct themselves with the viability of YOUR town (and theirs) the biggesta part of the their equation. Chains....not so much. In those cases where things are equal, that's reason enough for me to buy from Zingerman's, Van Boven, Schlanderer's, Fingerle, Anderson Paint, etc., etc. This has something to do with quality of life, too. Remember cool places like Drakes? Yeah. they don't all have to die. You can participate in their survival. Thu, Aug 19, 2010 : 2:47 p.m.
"Common denominator: they're all chains. Shop local!" Blah blah blah. This rallying cry is getting so old. Clothing is not an interchangable item that you can just say "I'm going to buy local." Thu, Aug 19, 2010 : 2:27 p.m.
Thu, Aug 19, 2010 : 1:05 p.m.
Thu, Aug 19, 2010 : 12:49 p.m. I would say, hello vacant retail space. This store will close and this company won't make it. Just my thoughts. Thu, Aug 19, 2010 : 12:19 p.m. I think we also need to allow the idea that maybe their product isn't that great to begin with. Thu, Aug 19, 2010 : 11:45 a.m.
You can NOT survive as a retailer at this price point by making your clothes in the U.S.
Thu, Aug 19, 2010 : 11:39 a.m.
Do Americans really care about where a product is made? Usually, price and style are more important. After all, we are a world economy now! Thu, Aug 19, 2010 : 10:59 a.m.
A couple of corrections: AA's famously sketchy CEO is named is Dov, not Don... and is @burger really an "upstart" restaurant? Thu, Aug 19, 2010 : 10:44 a.m.
Also hard to market your products as "Good Old USA Made" when you are busted multiple times for the hire of illegal workers to produce the items.